John Walter Christie was an odd duck who made a goodly amount of money motorizing fire equipment in the early 20th Century, but he fancied himself to have the perfect answer for creating a useful combat vehicle that combined wheeled and tracked drives on one chassis. Being an American, he first offered to the US Army but after purchasing only seven tanks from him they turned him down for any more vehicles. Highly miffed at the rejection, Christie then offered his designs abroad and sold them to the Soviets, the Poles and finally to the British. In the early 1930s the British was sorting out what kind of tanks they needed and came to the conclusions that they needed light tanks, infantry tanks, and fast cruiser tanks. Their first efforts at the “cruiser concept” were not really very cruiser-like - the A9 and A10 designs being equipped with the patented Vickers “Slo-Mo-Shun” suspension being a big giveaway. So they then looked to the Christie design to solve their problems of higher speed. Morris Commerical Cars LTD bought one of the two demonstrators Christie had used for the US Army and under the designation A13E1 it underwent trials in the UK. But while performance was good it was planned to use a similar design of turret to the A9 and A10 that mounted a 2-pdr gun in a two man abreast (three with commander) turret, so a new hull with a wider center section was built and under the designation A13E2 the new tank underwent testing starting on 7 October 1937. The usual sorts of teething troubles were found and as a result an evolved vehicle, the A13E3, was built. This passed testing and the new vehicle was adopted for service as the A13 Cruiser Tank Mark I. The tank evolved to the A13 Mark II and then A13 Mark IIA, but in 1940 the situation was complicated by complete renaming of the vehicles, with the A13 Mark I becoming the Cruiser Tank Mk. III, the A13 Mark II the Cruiser Tank Mk. IV, and the A13 Mark IIA the Cruiser Tank Mk. IVA. 337 tanks of all models were built between 1939 and 1941. All were mechanical similar - a new short-pitch track was used and the British did not bother with the convertible drive features of the original Christie, maintaining as tracked drive only. While the Mark I used a turret with smooth sloped sides and a water-cooled Vickers .303 machine gun in the turret, the Mark II added spaced plates on the sides of the turret set at steeper angles and the Mark IIA a 7.92mm Besa air-cooled machine gun. Top speed was 30 mph (50 kph) and range 80-100 miles (130-160 kilometers) on gasoline. The A13 was used in France and then in the early desert battles, but survivors were relegated to training by the end of 1941 and served with the non-deployed Cruiser Mk. V Covenanter at home; its linear descendent, the Cruiser Mk. VI Crusader, was associated with most of the big desert battles and was the mainstay cruiser tank until the US M3 and M4 types became widely available. The last Christie-based design to serve was the Cruiser Mk. VII Cromwell. Peter is a very thorough researcher and has tracked down where all of the tanks were sent and with which units they served. Most of the photos in the book are based on either snapshots from British war photographers or captured German shots of A13 tanks after capture. From most of the shots in the book, it appears one of their big drawbacks was fragile tracks as nearly all of the capture shots show the A13 missing one or both tracks. Modelers will love the excellent drawings of all the variants of the A13 Cruiser tank family as well as the 1/35 scale color plates which will make finishing and correcting the Bronco model kits much easier. Sadly Bronco used a great deal of faulty information when they made their A13 kits and as a result any true modeler will have to correct their mistakes. 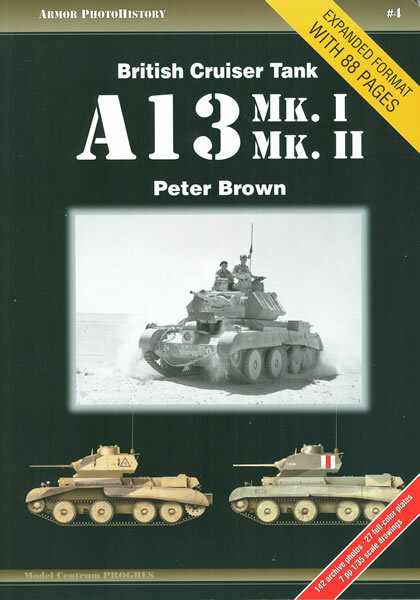 Overall while not cheap this is an excellent first effort from Peter (who has written numerous articles for “Military Modelling” and the Tank Museum journal “Track-Link” and is a one-stop source for the A13 family.